Hello everyone! 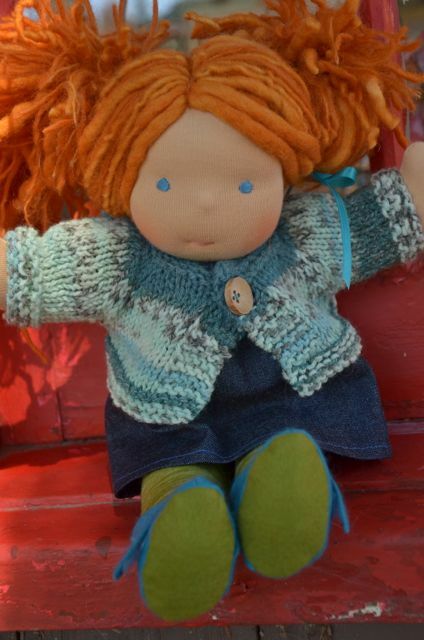 We’ve had a few new knitters join us here at Bamboletta – there is something about a doll in a sweater that is extra sweet. We noticed that there are many patterns available for our larger dolls (see Knitting Directory) but nothing for the smaller, Cuddle Dolls. I asked Julia to make a pattern up and write it out so that we could share it with you all. I can’t think of a nicer project to start off a Fall knitting season with! Happy Knitting! For the pattern, click Bamboletta Cuddle Doll or Baby Sweater . I love this! I’m going to give it a whirl, have been holding onto a cool green yarn that will work. whee!! How lovely! Thanks so much for sharing! Happy New Year and a Little Update!